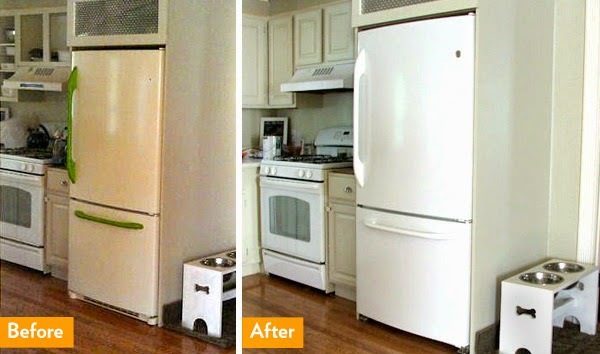 You know a fresh coat of paint can give any room a quick and inexpensive facelift. But did you know that a little paint can also perk up carpets, appliances, and even vinyl floors? Basically, if it doesn’t move, you can paint it. But only after you’ve paid special attention to prep — cleaning, patching, and sanding (generally) the area. Prime before painting. Primer will allow the paint to adhere better. Most hard surfaces will take primer better if they’re roughed up a little with fine-grade sandpaper. When using spray paint, multiple, thin layers are better than one, thick coat. Ease up on your trigger finger, and spray in short bursts. Wait for the previous coat of paint or primer to dry completely before adding another coat. With proper prep, you can paint just about anything. Spray paint can turn builder-grade brass locks and hinges into fashion-forward hardware with an oil-rubbed bronze, pewter, or stainless look. Clean hardware with a fine steel wool to remove grease and grime. Rough up the surface with fine-grain sandpaper. Before you paint, insert a tiny strip of painter’s tape into the keyhole to make sure paint doesn’t gunk it up. Prime with a metallic primer, then paint with metallic spray paint. Tip: Insert the door lock’s spindle into a square of Styrofoam, which will hold it upright while you spray around the knob. Stay tuned for the rest of this series of painting tips!